Beautiful independent villa situated in quiet and panoramic location on the hills of Umbria, between Perugia, Todi and Orvieto. This villa is very spacious and offers large, well-kept outdoor areas providing a private swimming-pool as well as a gym and a sauna. A beautiful pergola with barbecue is available for al-fresco dining, in the peace of Umbria landscape. The interiors are comfortable and nicely furnished. 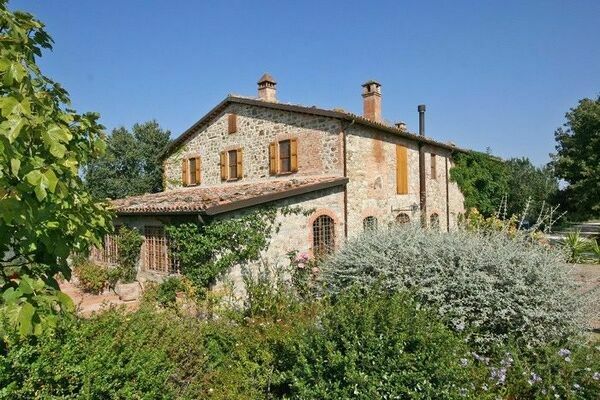 The villa is in ideal location to visit many of the charming towns of Umbria like Assisi, Todi, Orvieto and Perugia. The access to the property is via an unpaved but well-maintained road suitable for any car. Distances: San Venanzio with all kinds of shops 4,5 km away, Marsciano (railway station with daily trains for Rome) 12 km away, Todi 25 km, Perugia 40 km, the lovely town of Orvieto 40 km away, Assisi 70 km, Lake Trasimeno approx. 60 km away, the natural reserve of Montepeglia is 10 km away. All of the above destinations are between a 20- and 50-minute drive. At guests’ disposal: large garden with private swimming-pool (14 x 7 m – maximum depth 2,5 m – open from 15/05 to 15/09), pergola with barbecue, bread oven, 2 bikes. Washing-machine available (free of charge). In addition, guests can enjoy use of a gym (free of charge) and a sauna (€ 20,- / per day). The villa is equipped with mosquito nets and provides fast internet connection (free of charge). Parking within the grounds. Extra Services included in the rental price: swimming-pool cleaning twice a week. Extra cleaning € 15,- / per cleaning. Extra Services to be paid on site: Baby bed available free of charge and / or extra bed (€ 15,- / per day) available upon request. Maid service available by arrangement at € 12,- / per hour. Upon request it is possible to arrange nice lunches and dinners to taste excellent local recipes. Burning wood for the barbecue and bread oven available ay € 15,- / per quintal. Extra cleaning of the pool € 15, - per service. 600 m2 Ground floor: large living-room (satellite TV, DVD player), toilet, well-stocked kitchen (dishwasher, freezer, microwaves, oven, toaster, orange squeezer, American coffee maker), large dining-room with access on to the outside, twin-bedded room with ensuite bathroom with shower, toilet. 1st floor: night area comprising 4 double bedrooms (3 of them have a TV) each with ensuite bathroom (3 of the bedrooms provide a bathroom with bathtub while one bedroom has a bathroom with shower). One of the bedrooms has access on to the outside.